You must make reservations at least 5 minutes in advance of the time at Dasheene. Join Ladera Resort’s very own Wine Waiters in our Wine Cellar which boasts 500 various wines-we stock over 2000 bottles of wine. Your palettes will be taken on a Wine Tour of the World. The Dasheene Wine Cellar carries some of the best wines from world famous Vineyards/Wineries in Chile, Argentina, the USA (California) Europe (France) and Lebanon just to name a few. We cannot forget our very own Ladera Wines from Napa Valley and Lone Canyon-Ladera Sauvignon Blanc, Ladera Cabernet Sauvignon. Amazing view and good food! Would recommend going before sunset. Truly breathtaking views and wonderful food. My family and I had a wonderful lunch here. Highly recommend! This was the complete dining experience from the stunning view to the amazing food and service. Although this was an expensive meal, it was totally worth every penny. This is a must when in St. Lucia. View was beautiful, but food was over-seasoned and drinks were not refilled promptly. Everything was outstanding, including the service. The only reason it got four stars was I felt a little rushed to pay the bill at the end. Good food. Good service. Best view you will ever see in your life while having a drink/meal. Just stunning. Really lovely, spectacular view and chocolate mousse was divine! Simply incredible. If you have the time, or even if you don’t, you have to stop by here for lunch or a drink. Best view I have ever had in a restaurant. Oh, and the food and service are great too! Fantastic food..especially friendly and gracious service, and the view between the Pitons of St. Lucia cannot be compared to anywhere else--a most memorable experience in every way. One of the best views you will ever experience in a restaurant. Amazing experience. Beautiful afternoon cocktails and sunset dinner overlooking the Pitons in St Lucia. Can’t get this experience anywhere else on the island. Absolutely amazing experience! We were so glad we chose Dasheene over the other excellent fine dining options in the area. The view, food, ambience, and overall experience cannot be beat. Thank you for a truly memorable dinner. We so enjoyed our experience at Dashene, with the exception of the rainy weather, which of course no one had any control over. From the moment we entered the restaurant to be greeted by the delightful hostess Lee to the gracious and knowledgeable server C.J. until we reluctantly left, we were happy. We were in St. Lucia for only a few hours from a cruise a 90 minute drive away. I didn't realize when I made the reservation that the day we were there (Sunday), they serve buffet only at lunch. When I told Lee we were hoping to have a light lunch, she spoke to the chef and told us we could order from the lunch menu, as we had come from so far away (Canada). 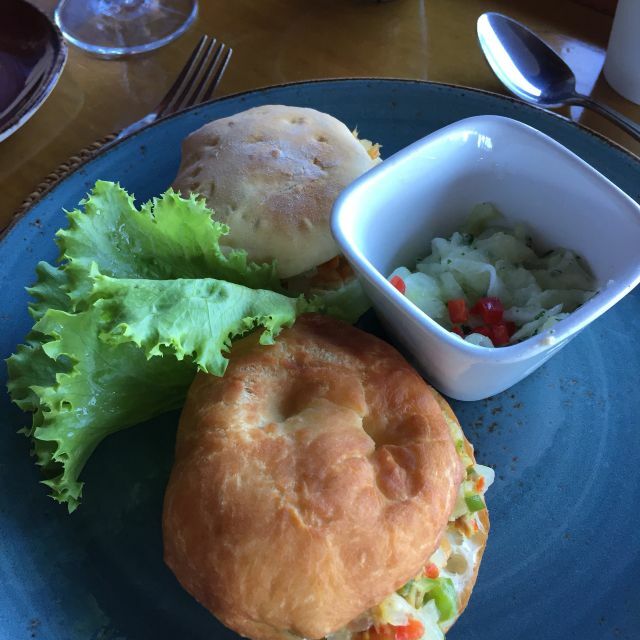 My husband ordered the Goat Sliders and I ordered the Green Fig & Saltfish Salad....the National Dish of St. Lucia. Both were delicious. My husband said it was one of the tastiest dishes he's ever eaten. The view is spectacular on a sunny day. The ambience charming. A small group of musicians played local music as we dined. I highly recommend a visit to Dashene when on the island of St. Lucia. Wonderful and warm service. Incredible views. It was absolutely beautiful. The views, the service, the food were all amazing! Amazing views and good lunch worth the trip up from the coast for lunch. We were there for New Year’s eve. While the food was good (not outstanding) it was extremely overpriced. We paid 200USD per person for the fixed menu and a bottle of wine. After waiting an hour, as they couldn't find our open table reservation, we ended up with a perfect seat. The music was too loud for such a beautiful outdoor setting. The food was good, but nothing amazing as St Lucia has many amazing restaurants. The service was slow, even by island time. For $125 a person, I just expect more. Absolutely amazing!! The food, the wine, the ambience and the view - spectacular! Despite having made our reservation weeks in advance and having noted a member of our party had celiac disease, the prix fix menu had 3 options, all w gluten. The waiter was not informed on gluten and the service was very slow. The food was tasty but not worth the fixed price amount. The view is extraordinary - and really the only thing worth going for. The Lobster Extravaganza lives up to the hype. I had grilled lobster one night and a lobster salad another night. Some of the best lobster that I have ever eaten! AND, Shekina decorated a lovely table with a great view for our anniversary dinner! We were delighted! We drove from Gros Islet to enjoy a dinner from Dasheene one night during our vacation in St. Lucia. We really enjoyed everything about this place: the view, the service, and the food was absolutely amazing. Our ONE and ONLY complaint is the music... we arrived around 5:30 and begin to sit and enjoy dinner from about 6-8pm. During this time, the music that was being played was Wu Tang Clan, and Biggie... NOW, I am not saying I do not enjoy this type of music, as obviously, I know who the artists are. But when you are spending $200 USD on a meal, you don't want to hear foul language and obscene music. I just want to point that out, so that the problem can potentially be fixed. Changing the music would definitely "up" the romantic vibe here... other than that, everything was top notch, and I would highly recommend Dasheene to everyone who visits St. Lucia.